1_72_aircraft_news 1/72 1/72 kits incoming Lockheed Shooting Star T-33 Tanmodel .:TANMODEL™:. 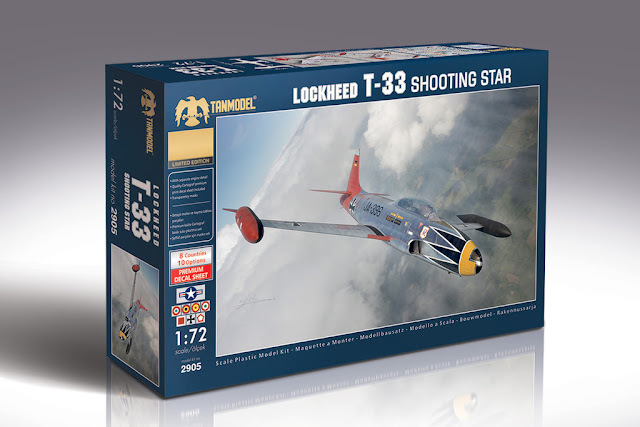 Lockheed T-33 "Shooting Star"
We will be glad to announce you our new kit that is the result of collaboration with the famous Japanese kit manufacturer, PLATZ. We are going to put on market the PLATZ 1/72 T-33 kit with AC-14 code having engine details which you all know well but struggle to find especially in European markets under TANMODEL label with special box content. Special box content that we prepared for you includes premium quality Cartograf print decal set with rarely seen range in 1/72 scaled kits, mask set for clear parts and A5 size leaflet inst. sheet with colored printed profile drawings. Especially for the collecter modelers we would like to state that our kit is in limited edition. Every box will have a unique number, boxes will be designated individually via hologram sticker. Parcels with differently designated boxes will be sent to our distributors. Distribution will be completed in 2 weeks. We would like to launch our kit with the box content that we prepared for you at affordable price. You can follow our official facebook page about developments on Tanmodel. Also we will update our official website in 1 week.